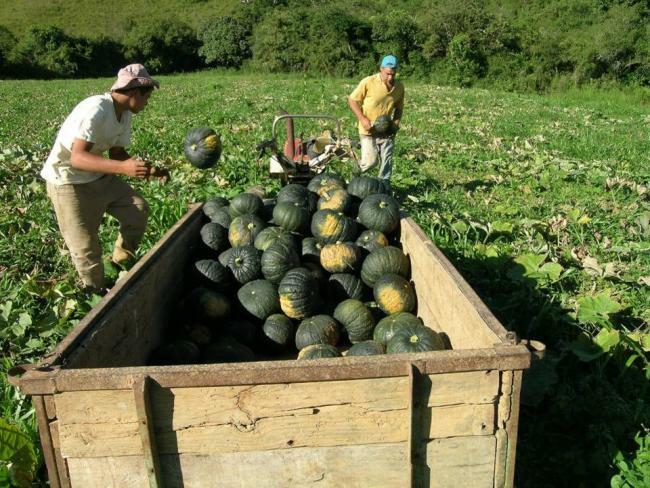 Harvesting abóbora japonesa at a farm in the state of Minas Gerais, Brazil. Brazil is the size of the Continental United States and has the second largest population in the Americans, after the United States, with over two million inhabitants. Massachusetts has the largest Brazilian population in the United States, estimated to be over 200,000, and it is the largest immigrant group in the Commonwealth. Frank Mangan has introduced several crops to commercial farmers popular among Brazilians, including abóbora, jiló and maxixe. Several graduate students and post-docs from Brail have come to UMass for graduate studies and to collaborate on research and outreach projects. In 2012, UMass Amherst signed a Memorandum of Understanding with EMBRAPA, Brazil’s corollary to USDA ARS, to build on collaborations between the two institutions. As part of this MOU more graduate students and researchers from Brazil will be coming to UMass. This MOU can also facilitate UMass students going to Brazil for educational and research projects. Frank Mangan’s program also has strong relationships with the Federal University of Viçosa in the state of Minas Gerais. Vicosa is one of the best agricultural universities in Latin America and is located in one of the most important agricultural states in Brazil, Minas Gerais. Mass. Governor Patrick (center) signing a MOU between EMBRAPA and UMass Amherst in Brazilia in 2012.